Video Visitation is now available for registration and scheduling of video visits. Video Visitation is an easy way to visit with your inmate from home over the internet by using your home computer. Video visits are available to you during normal business hours, but also available in the evenings, on Holidays, and over the weekend. The cost is $12 per 30 minute visit (Depending on their status, some inmates may get 45 minute visits; the cost is still $12). To ensure the best quality video visitation experience, please click on the following link before registering or scheduling a visit. Go to www.icsvideovisit.com, (scheduling instruction guide) select Boulder County Jail, CO, choose Visit At Home (Remote) and follow the 5 steps to register, test your system, set up and add funds to your account and set up your system for an in-home visit. To contact IC Solutions Technical Support regarding video visitation issues, call 1-888-646-9437. 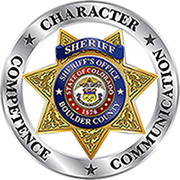 The Boulder County Jail continues to offer face-to-face Security Visits at the jail. Prior to scheduling Security visits at the jail, visitor(s) must pre-register with Reception at the jail during normal business hours, which are Monday through Thursday between the hours of 7:30 a.m. to 5:00 p.m. and Fridays between the hours of 7:30 a.m. to 3:00 p.m. Excluding County Holidays. Visitation appointments must be made one day in advance of the scheduled appointment. Call Friday to schedule a Monday visit. YOU MUST ARRIVE AT LEAST 15 MINUTES EARLY TO CHECK IN WITH RECEPTION, OR YOU MAY LOSE YOUR VISIT. You must bring a valid photo I.D., with date of birth, and you will be required to clear the metal detector. Inmates are eligible for 1 visit per week, Monday through Friday. A parent or legal guardian must accompany children under 18 years of age. Inmates can have up to 2 visitors at one time for Security Visits. To schedule an appointment for a visit taking place at the jail call 303-441-4600 – option 2, Monday through Thursday between the hours of 7:30 a.m. to 5:00 p.m. and Friday between the hours of 7:30 a.m. to 3:00 p.m.